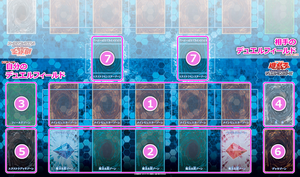 The Pendulum Zones (Japanese: ペンデュラムゾーン Pendyuramu Zōn, abbreviated Ｐ（ペンデュラム）ゾーン in card text) are two card Zones introduced in Starter Deck 2014. Each player has two Pendulum Zones: the left Pendulum Zone, colored blue with a blue Pendulum Scale jewel; and the right Pendulum Zone, colored red with a red Pendulum Scale jewel. In the Yu-Gi-Oh! ARC-V anime, they are depicted as blue columns of light when occupied (no column is shown when that Zone is vacant). In addition to being played as a monster, a Pendulum Monster can alternatively be activated from the hand as a Spell Card in a Pendulum Zone. Some card effects can place a Pendulum Monster in the Pendulum Zone without activating it. While in a Pendulum Zone, the Pendulum Monster's Pendulum Effects are applied rather than its monster effects. A Pendulum Monster cannot be Set in a Pendulum Zone. Pendulum Monsters are only treated as Spell Cards (of a non-specific variety), not monsters, while in a Pendulum Zone. The Pendulum Zones are located in the leftmost and rightmost Spell & Trap Zones. These Spell & Trap Zones are treated as Pendulum Zones as well only if there is a Pendulum Monster (that is not treated as an Equip Card) in that zone, regardless of its complementary zone, but effects that place Pendulum Monsters in Pendulum Zones can still place them in these zones even while they are unoccupied. Prior to the release of Starter Deck 2017 in the OCG and Starter Deck: Link Strike in the TCG, the Pendulum Zones were distinct zones in which only Pendulum Monsters could be placed, and only as Spell Cards. The left Pendulum Zone was located in between the Field Zone and the Extra Deck Zone, and the right Pendulum Zone was located in between the Graveyard Zone and the Deck Zone.